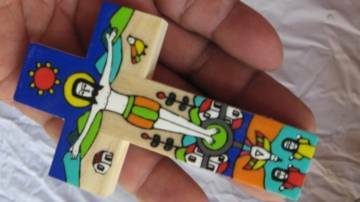 Resources for secondary schools about Saint Oscar Romero of El Salvador. Blessed Oscar Romero, the great Archbishop of San Salvador was made a saint on 14 October 2018. Use our resources to celebrate his life and legacy. A short film about Blessed Oscar Romero, a CAFOD partner and defender of oppressed people in El Salvador, who was martyred in 1980. Can't see the YouTube film? Right click to download to your desktop. Download our Romero timeline to find out about his life. Use our assembly to celebrate Blessed Oscar Romero's canonisation on 14 October 2018. Reflections and liturgies inspired by Oscar Romero. Order a free Romero poster for your classroom or group. Blessed Oscar Romero, a CAFOD partner, will be canonised on 14 October 2018. This assembly PowerPoint includes a life-story, prayer and reminder that we are all called to be saints. Find out about CAFOD's work in El Salvador today. 5 things for youth groups to do with your 'Aspire' poster and postcards.